We’re hoping to have the, twice-cancelled due to weather, inaugural Girard- to- B&O launch in August, rather than the end of September. I’ll post it as soon as the plans are finalized. In February, 2014, a Youngstown Vindicator writer published the first indication to the public that the Friends of the Mahoning River had approached Mayor James J. Melfi of Girard to consider developing a canoe/kayak boat dock on property the City owns on the Mahoning River. One of our members, Don Rex, had noticed a grant offered by the Ohio Department of Natural Resources through the Division of Watercraft. This was a 100% reimbursable grant available to political subdivisions and agencies of the State or federal government. One of the main requirements was that the applying agency had to be capable of financing and maintaining the project as a public access facility for a minimum of 25 years. The Friends of the Mahoning River had a great interest in the project. 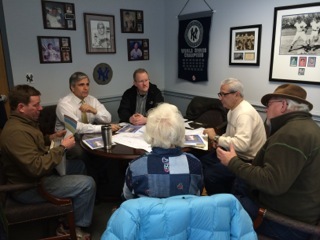 Don, Tom Smith and Sara Smith volunteered to meet with Mayor Melfi to explain the main features of the grant. Combined with the knowledge that the Trumbull Canoe Trails Club had in their membership, Friends felt that a presentation to the Mayor would receive a favorable response. Mayor Melfi was enthusiastic about using land that FEMA had granted to the City that was a floodplain south of the Girard viaduct. Because of the land being in a floodplain, there was little else that could be placed there. Mayor Melfi presented the idea to City Council in February. Earlier that year, Don, Tom, Sara and Patricia Dunbar had each given a speech to the members of Council who would be deciding and recommending that the City pursue this grant. The four introduced themselves and informed the City representatives what FOMR as a group represented and expressed the cooperation that would be given. An interesting aspect of that day was that 25 years ago, on that exact date, the then Mayor Kenny Woodford and Don Rex, who was a councilman at the time, had presented a motion to create a launch site on the River in Girard at a different location. A summary of the details that consisted in this grant were explained and questions answered. Plans began to add this additional recreational area in Girard. This bid was then prepared by George Zockle of CT Consultants, Inc. in cooperation with the Friends of the Mahoning River and sent to Columbus by April 1, 2014 which was the due date of the grant. The final figure was $68,855 which included a dock, a ramp, lighted parking area for 15 vehicles, and a turn-around area for loading/unloading. Two streets, Front Street and River Street, would be extended to provide a safe entrance and exit. Three lawn areas were part of the project so that future grants could be used to provide concrete picnic tables and benches. A final decision will be made in the fall of this year. The actual date is reliant upon the state legislature’s approval of the State Capital bill and spending approval from the State Controlling Board. ← Join the Water Sentinel Program!